What duration would be considered as “normal” for potty training a toddler? * A few days? * A few weeks? * Couple of months? * More than that? From what I gather, it's a matter of approach. I’ve seen articles referring to potty training as a long and gradual process that could take a few months. Those articles usually reflect the child oriented approach. My view is different, but to simplify let’s just say that if it feels like a struggle; if toilet training drags out, not progressing, causing frustration and stress -- it can be considered as Delayed Potty Training. Searching the web for relevant articles, I was able to find one by Nader Shaikh mentioning possible causes for delayed training (Ref. #1: Time to get on the potty: Are constipation and stool toileting refusal causing delayed toilet training?). To be logical, it does make sense that potty training will last longer for children who develop constipation, or experience stool toileting refusal. It is also likely that those children and their parents will experience the toilet training process as a difficult one. As a mom though, I’m interested in asking a different question in regard to delayed potty training: I’m wondering if there are any factors related to the way parents conduct potty training, which could influence the effectiveness and the length of this process. 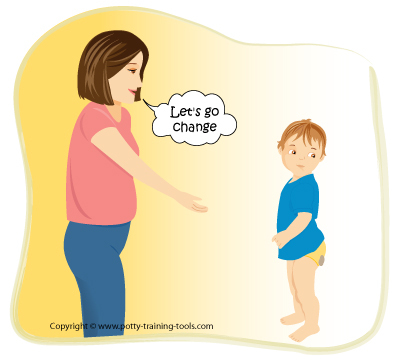 The general approach that we’re taking in toilet training: Whether we take the “child oriented” approach; letting the child set the pace (and perhaps the rules) and simply “flow” with that – OR – we take a more structured approach, set clear expectations for toilet training behavior, and manage the process by our own set of rules. The way we respond to acts of struggle from our kids, or How we handle toilet training resistance. For parents of children who have developed Stool Toileting Refusal and encopresis: Is there a certain type of parental response that would be more effective than others? For instance, if the child has developed a continuous behavior of encorpresis, would it be more effective for the parent to act tolerant and say stuff like “don’t worry, nothing happened, you’ll get it next time” – or should the parent make it clear to the child that such behavior is not acceptable? I haven’t found references for Studies discussing the effect of parental behavior in regard to delayed potty training. There's a study by Taubman et al that mentions parental intervention in the context of Stool Toileting Refusal, which could be linked to delayed potty training (Ref. #2: Stool Toileting Refusal: A Prospective Intervention Targeting Parental Behavior). This study instructed parents in the intervention group to avoid using negative language or gestures in relation to feces, in order to reduce the negative connotation. The intervention did not decrease the occurrence of stool toileting refusal, but it did shorten the time it was present. This in turn resulted in the children toilet training earlier. Another interesting study, by Schonwald et al suggests (the results were not conclusive) that difficult toilet training is associated with difficult temperamental traits in children (Ref. #3: Factors Associated With Difficult Toilet Training). Examples for difficult traits being: less adaptable, more “negative in mood”. The study also links difficult traits with constipation and hiding to stool, and other patterns associated with toileting struggle. So if it’s true that children characteristics, leading to children’s behavior, can affect the course of toilet training and whether it goes smoothly or not (to over simplify), then by the same logic -- the way that parents handle children’s behavior in the context of toilet training, can also have impact. With or without the Studies, I believe that parental approach and behavior towards toilet training can influence the effectiveness and the duration of this process. As to what may be the recommended parental approach -- that remains subject to intuition and opinions. The two-cents I can offer from my experience is: If you feel you are struggling with toilet training, if the process extends for months and causes frustration and stress in the family and in your parenting -- seek help from a professional advisor. If it’s not working, don’t keep repeating the same things you’ve been doing. It is probably best to try and approach things differently, and to do that we sometimes need to get an outside point of view. 1) Nader Shaikh. Time to get on the potty: Are constipation and stool toileting refusal causing delayed toilet training?. Journal of Pediatrics.July 2004.Vol. 145(1).pp 12-13. 2) Bruce Taubman MD, Nathan J. Blum MD, Nicole Nemeth MD. Stool Toileting Refusal: A Prospective Intervention Targeting Parental Behavior. Arch Pediatr Adolesc Med.2003.Vol 157.pp 1193-1196. 3) Alison Schonwald, Lon Sherritt, Ann Stadtler and Carolyn Bridgemohan. Factors Associated With Difficult Toilet Training. Pediatrics.2004.Vol 113.pp 1753-1757.